Mmm. This was my dinner tonight, spaghetti al tonno. Just use the fancy tomato sauce you’ve been saving in your cupboard. I recommend Borracchini’s Cioppino style spaghetti sauce in a jar. I just use half. Heat it, stir in a can of tuna (preferrably packed in oil), and when the spaghetti’s ready, mix it together. You can capers to spice it up a bit. Spaghetti warns us never to use parmeggiano on fish. Who am I to argue. I remember having dinner once with my Italian family, and they asked us what we had for dinner in America. 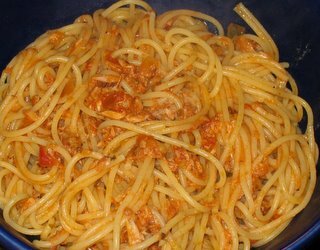 My room mate answered ‘spaghetti.’ My Italian family, looked around at each other, and I had to explain to them that in America, spaghetti is a main course, especially among single men in college. They were a little shocked. To them, pasta is a side dish, so it’s a little like suggesting to an American that potato salad can stand alone as a main dish. I considered telling them that sometimes American college students eat a bowl of cereal for dinner, but I didn’t want to hurt their feelings. This entry was posted in seattle by jp 吉平. Bookmark the permalink.